The Hodedah Kitchen Island with Towel Rack is the perfect choice for extra storage and style in any sized kitchen. Made in the available color options, this kitchen island includes a sturdy wood top and towel bar on one side. Enjoy storing your spices in the large spice rack and your utensils in a roomy top drawer. The double-door bottom cabinet provides you with plenty of extra hidden storage for dishes and more, and wheels on the bottom allow for easy mobility. Dimensions: 44.9W x 15.5D x 35.2H in.. Solid wood island with wood countertop. Finish options available. Includes spice rack, towel bar, paper towel dispenser, 1 cabinet with shelf, & 1 drawer. Countertop size: 44.9W in.. Includes locking casters. Assembly required. Modern/contemporary style. Dimensions: 44.9W x 15.5D x 35.2H in. Nooks aren't all they're cracked up to be, especially when you can have breakfast anywhere you like with the Casual Home 3-Piece Breakfast Set with Solid American Hardwood Top. Crafted from solid wood with a finish that highlights the contrast of smooth white with natural wood grain, this charming set offers a pair of matching stools that slide right up next to the table. It's perfect for smaller areas and has a classic style that's suitable for any space. Set includes table and 2 stools. Stool dimensions: 12.75W x 12.75D x 24H in.. Table dimensions: 23.5W x 36D x 34H in.. Solid hardwood construction. White bases with natural-finished top and seats. Simple and versatile design. Stool dimensions: 12.75W x 12.75D x 24H in. Table dimensions: 23.5W x 36D x 34H in. The contemporary Hodedah HIK77 Microwave Cart is crafted of durable wood in your choice of attractive finish and features sleek silver-colored hardware. A double-door bottom cabinet and center drawer offer you lots of room to stash utensils, dishware, and much more. The shelf is ideal for a range of small appliances, and wheels on the bottom assure easy mobility. 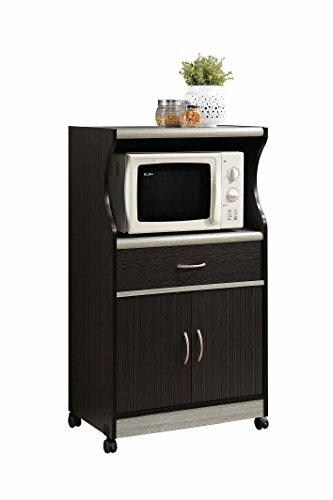 Dimensions: 23.6W x 15.5D x 45.4H in.. Wood microwave cart. Finish options available. Includes 1 cabinet with shelf & 1 drawer. Countertop size: 23.6W in.. Includes space for small appliances. Includes casters for mobility. Assembly required. Modern/contemporary style. Dimensions: 23.6W x 15.5D x 45.4H in. Keep your kitchen area clean and organized with the Nova rolling kitchen trolley. This versatile kitchen accessory features two drawers, two shelves, a cutting board, and a metal basket all on a rolling, portable frame. The wood design lets it fit in with almost any home or kitchen d cor. Having this trolley will help when you need more storage space in your kitchen and it will keep everything tidy. With tons of storage opportunities, this trolley is the perfect kitchen accessory for beginners as well as professional cooks. Save room in your kitchen today with the Nova rolling kitchen trolley and start making your meals in style! 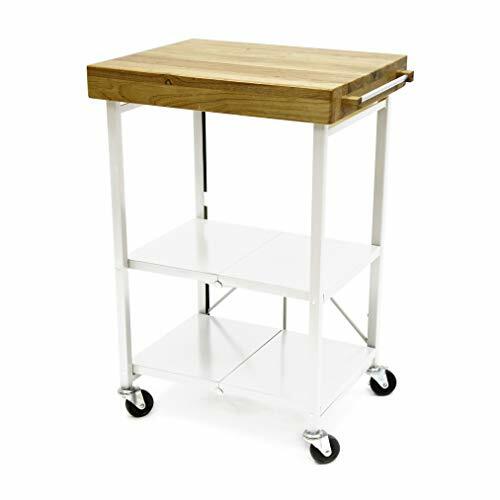 Sturdy & Durable This Wood Kitchen Storage Cart is made of real wood and high quality materials to support all your kitchen accessories,offers a sophisticated look for any kitchen.It's not just restricted to the kitchen, use it anywhere that is convenient for you! Thoughtful Design Make the most of this unit with its 3-tier design featuring two storage drawers, two baskets,two open shelves and 6 bottles wine rack,has the perfect amount of room you need to store fruit or kitchen utensils,stainless steel rack can be used to hold hand towels. The removable metal baskets for easy cleaning, loading and unloading. Compact Shape With its smaller size, this cart offers plenty of additional storage without taking up a whole lot of room making it perfect for smaller houses, apartments and those simply lacking space in their home,helps to Add extra counter and storage space to your kitchen or dining room. Easy Portable And Install Four smooth-rolling 360-degree spinner wheels feature a built-in safety latch to help keep the cart in place during food preparation,the removable metal baskets for easy cleaning, loading and unloading.Our rolling kitchen cart comes ready to put together and requires only light assembly with all instructions and hardware provided. Dimension & Warranty Overall Size:26.5(L) x 14.75(W) x 29.5(H) Weight: 18.5 lbs 24 hours Customer service:feel free to contact us for quality or other issue, we will come back to us within 12 hours!We offer a 100% Money Back Guarantee! The Eva Kitchen Cart provides plenty of space for storing all of your favorite kitchen goods. This kitchen cart is constructed of a solid Beechwood frame and has a natural finish to complement any decor. The cart features a spacious top surface, a drawer, and a side towel rack. In addition, you'll find two doors that open to a generous storage spot with a removable shelf. It's equipped with rolling casters for transporting convenience. Store your most used goods in this kitchen cart to provide much more convenience in your kitchen or dining area. The storage space below has a height of 24.5 inches. With the shelf intact, the top shelf is 10 inches high and the bottom shelf is 14.5 inches high. Overall dimensions: 19.25D x 25.5W x 34H inches. Winsome Trading has been a manufacturer and distributor of quality products for the home for over 30 years. Specializing in furniture crafted of solid wood, Winsome also crafts unique furniture using wrought iron, aluminum, steel, marble, and glass. Winsome's home office is located in Woodinville, Washington. The company has its own product design and development team, offering continuous innovation. Solid Beechwood frame. Side towel rack. Hidden storage with removable shelf. Sturdy rolling casters. Perfect for compact microwaves. Dimensions: 19.25D x 25.5W x 34H inches. The Origami - Foldable Kitchen Island cart Opens and folds in seconds. 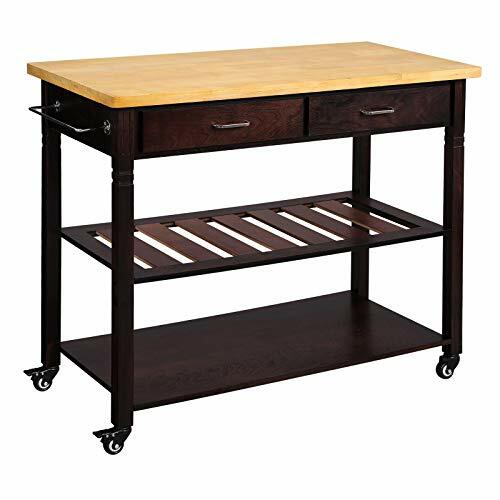 Versatile kitchen island or side cart. Colorway : white. Keep your daily kitchen essentials rolling along next to wherever you are with the Oceanstar Bamboo Kitchen Trolley. It provides both functionality and efficiency to your everyday kitchen tasks. 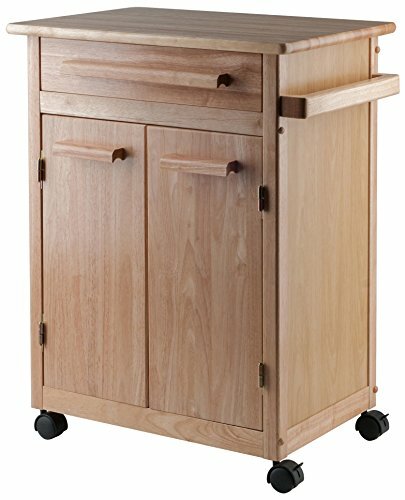 The Bamboo cart is small enough for any kitchen and just big enough for extra storage room. 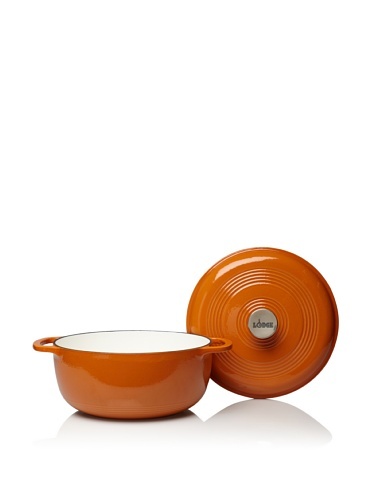 It provides both functionality and simplifies your everyday kitchen tasks. The cart comes with a drawer to keep your utensils, three shelves to hold your kitchen gadgets or small items, the bottom shelf acts as also a wine storage rack as well. 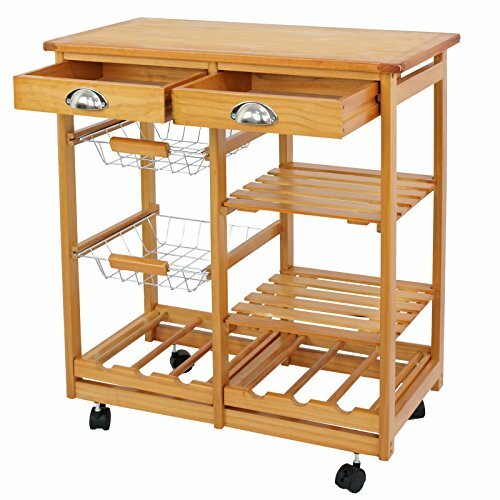 The Oceanstar Bamboo Kitchen Trolley is the perfect addition to any kitchen. The Clevr Rolling Bamboo Carts are made out of high quality, sustainably sourced, kin-dried and varnished bamboo. Suitable for all your kitchen needs, this cart is perfect for food prepping or serving. It features a convenient drawer for the most commonly used utensils at hand and added kitchen storage. The cart also features four non-marrying casters, two of with locks. 4 heavy-duty casters, 2 of which are lockable. You can wheel this kitchen cart anytime you need, and stop it anywhere you like. 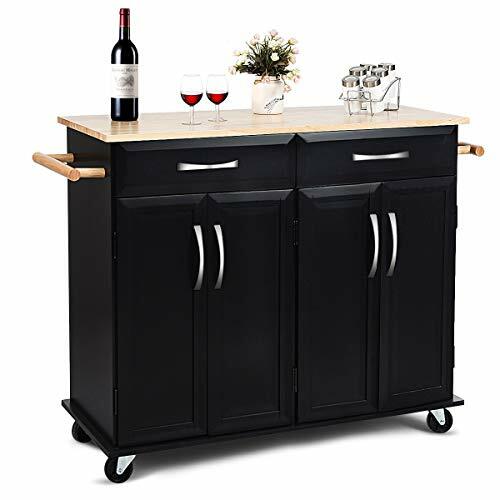 Kitchen Wonderland Turn your kitchen into a place you love to be with this rolling kitchen island. Ideal for apartments or smaller kitchens, this cart can give you the extra space you need to create your perfect dinner. With the mix of dark walnut and light maple colors, this cart will not only serve a convenient function, but it will also look good in the process. Convenient Utility This kitchen island boasts 3 tiers offering a variety of storage options, giving you the necessary space to arrange your cookbooks, spices, and extra pots and pans with room to spare for prepping food. As making dinner can get messy, there is a towel rack on the side for wiping your hands or cleaning the solid wood tabletop. This is ourbrand new and high quality kitchen trolley cart which is an ideal choice foryour kitchen or dining room. The frame is made of premium PB and MDF, so thiskitchen trolley is sturdy and durable enough for long time use. Features twodrawers and two cabinets which provide ample storage space for you to organizeyour items. The rubber wood top also provides extra counter space for kitchento prepare delicious food. Two convenient handles make it more comfortable forpush or you can use it as towel racks. Equipped with 4 rolling casters for easymovement, and 2 of them are lockable to ensure the stability while using thekitchen cart. Don't hesitate to buy one! 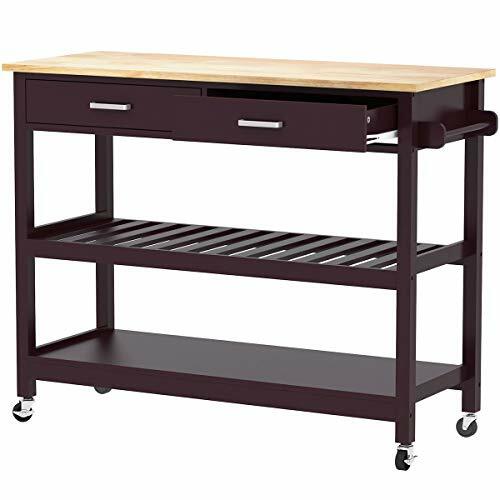 Sturdy Construction and Long-lasting Use : Constructed of high quality MDF and PB materials and the surface is coated with black protective paint, this kitchen cart is durable and stable. Rubber wood top is strong enough to store your kitchen items. Simple and classic design that is not out of date and can be perfectly combined with most home decor styles. Sufficient Space for Storage and Display : Two drawers, two cabinets and two towel racks provide ample storage for your kitchen and dining essentials to make your kitchen look more organized and tidy. Moreover, the towel racks can be used not only to hang towels but also as push handles for easy control of the kitchen cart. Adjustable Shelves Design : Each cabinet has an adjustable shelf, with three heights to choose from, and the shelves are adjusted as needed to store items of various sizes. Intimate design to meet your requirements to the greatest extent. Flexible Swivel Casters : The four wheels at the bottom can be rotated 360 degrees, making it easy for you to move it anywhere. There are two wheels with brakes, and when you want the kitchen trolley to stop somewhere, you can lock the two wheels. 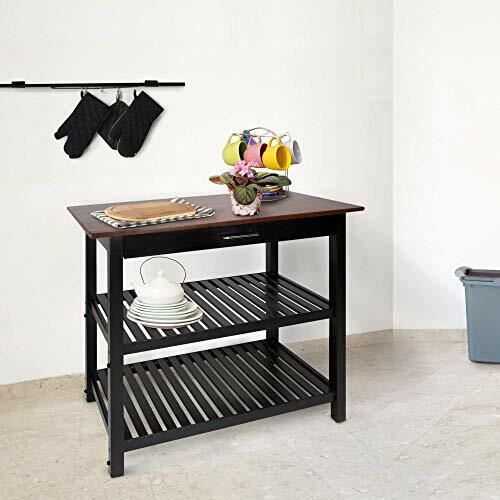 Easy Assembly and Great for Use : This versatile kitchen storage cart is great for kitchens, apartments, hallways, or anywhere you need more extra storage. Assembly instruction is detailed and specific. All parts are given a number and each assembling steps are listed. This is our brand new and high quality serving cart which is an ideal choice for your kitchen or dining room. Made of premium fir and iron materials, this kitchen trolley is sturdy and durable enough for long time use. Features three shelves which provide ample storage space for you to organize your items. The tray top is removable so that you can use it according to your needs. Two convenient handles make it more comfortable for push or you can use it as towel racks. Equipped with 4 rolling casters for easy movement, and 2 of them are lockable to ensure the stability while using the serving cart. Don't hesitate to buy one! If you have questions about purchases from us, contact us through Amazon's Message Center. 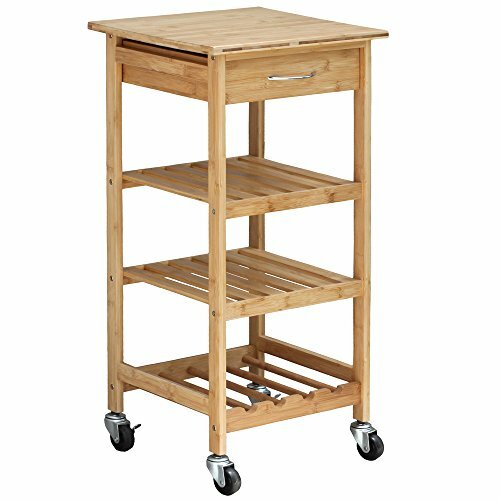 Sturdy Construction and Long-lasting Use Constructed of high quality fir and iron materials, this kitchen cart is durable and stable. The metal frame gives the kitchen cart a stronger load-bearing capacity to meet your daily use needs. Sufficient Space for Storage and Display Three shelves provide ample storage for your kitchen and dining essentials to make your kitchen look more organized and tidy. With two rows of racks for hanging your wine glasses. Moreover, the towel racks can be used not only to hang towels but also as push handles for easy control of the kitchen cart. 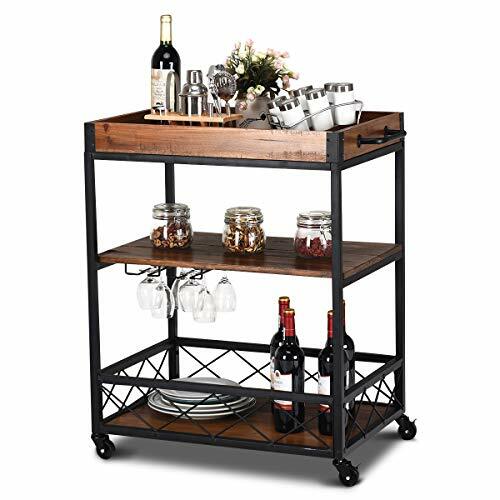 This serving cart can meet your various needs. Removable Tray Box and Flexible Swivel Casters The top tray is removable so that you can use it alone or in the serving cart. The four wheels at the bottom can be rotated 360 degrees, making it easy for you to move it anywhere. There are two wheels with brakes, and when you want the kitchen trolley to stop somewhere, you can lock the two wheels. 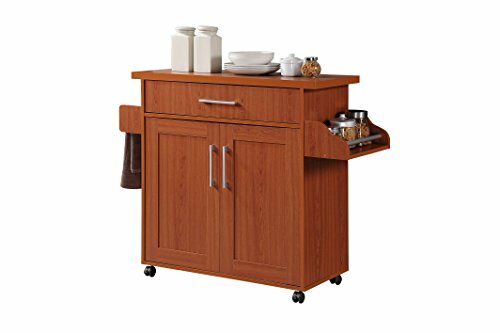 Versatile Serving Cart This versatile kitchen storage cart is great for kitchens, apartments, hallways, or anywhere you need more extra storage. Simple and rustic industrial design can be combined with most home decor styles perfectly. Easy Assembly Assembly instruction is detailed and specific. All parts are given a number and each assembling steps are listed.